Sadly, the history of the P&C factory from 1941 to 1990 mirrors that of many other small American companies. Gobbled up by increasingly larger corporations until being deemed “not cost effective”…followed by extinction. 1941…John Peterson and Charlie Carlborg’s original company is now under the ownership of Plomb Tool Company of Los Angeles, California. Tools labeled “Plomb” and “P&C” are produced at the factory. J. Earl Jones becomes company president under the new management. 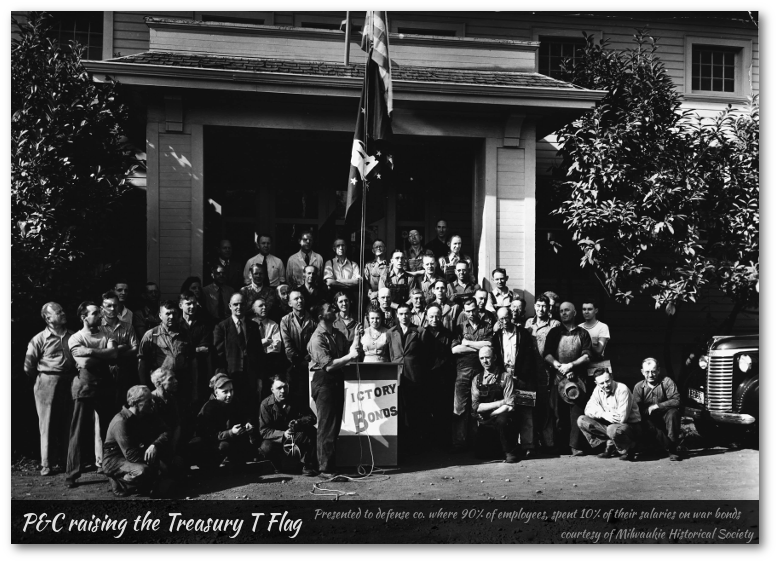 1942…First woman, Hazel Keith, begins working in the plant (outside of office personnel). Also in 1942, Plomb acquires the Penens Corporation in Los Angeles, increasing Plomb’s production capacity for WWII contracts. Some of these contracts result in special markings on P&C Tools. Many P&C and Plomb tools produced during the war bear “WF” stampings in addition to the “P&C” or “Plomb” stamp. These tools are produced for the military in an immense contract that runs much of the war. A 1943 Plomb pamphlet entitled, “These Are Your Weapons” contains a photo captioned, “drop delivery of assembled Wright Field ratchets”. It is most likely the “WF” stamp stood for “Wright Field” (air base located 5 miles northeast of Dayton, Ohio). Which begs the question…what did the specialty “N” stamp stand for? With known Navy contracts did it stand for “Navy” or possibly “Norfolk”? Many P&C round handle box wrenches can be found bearing the “N” stamp. 1946-1949…Fayette R. Plumb, Inc. v. Plomb Tool Co.
An unfortunate lengthy legal battle that began in 1926 and continued through 1949, rooted in the similarity of the corporations’ names. The highlights…or maybe “lowlights”, include the following paragraphs. The dispute arose in 1926 when Plomb applied for a “Plomb” trademark. Fayette R. Plumb, Inc., commonly known as “Plumb”, quickly files a lawsuit. The result is a settlement wherein Plomb agrees not to use it’s name on any tools the companies have in common. Plomb apparently violates that agreement and other law suits ensue. Plomb again fails to comply with the court order. Another suit is filed and in December of 1948, the court again rules in favor of the plaintiff. In the decision Plomb is ordered to comply with the previous court orders and pay to Fayette R. Plumb, Inc. all the profits made from March of 1948 on the sales of tools carrying the “Plomb” label. The lawsuits are generally complete by the spring of 1949. Plomb has to temporarily close down and promptly files an appeal. Whether the Portland P&C Plomb factory temporarily shuts down is unknown. The company estimates it will have to pay $540,000 in profits and costs to Plumb and a total trademark switch could cost them about $1,000,000. At the conclusion of all the court battles, who actually knows what the total financial losses are to both companies. Thus in 1948, Plomb begins stamping tools with “PROTO”, derived from PRO for “Professional” and TO for “Tools”. They file for the “PROTO” trademark on February 2, 1948 stating the first use was January 23, 1948. Several other versions of the “PROTO” trademark follow. The “Proto Tools Professional Quality Los Angeles” trademark is filed on May 21, 1951 and expired on January 25, 1993. By early 1950, the changes are complete and “Plomb” stamped tools are history. 1947…Plomb-Proto moves the Penens operation to Schiller Park, Chicago. This P&C “sister” factory produces hand tools of the Fleet and Challenger brands. Also in 1947, Plomb-Proto acquires the J.P. Danielson Company (est. 1903) in Jamestown, New York. This P&C “sister” factory produces many types of pliers and adjustable wrenches. Eventually this sister factory produces all of the pliers and adjustable wrenches stamped with the P&C hex. Crescent Tool Company (est. 1907), of the famous “Crescent” adjustable wrench, is also located in Jamestown. 1948…Open House at P&C for the public. Souvenir gifts are given to families and children accompanied by parents are treated to free popcorn and soft drinks. Following the open house P&C employees gathered for a potluck supper and program for employee awards and recognition. 84 people are on the payroll. The Plomb Tool Company is continuing to operate under their original business name but their tools are now stamped and known as Proto. 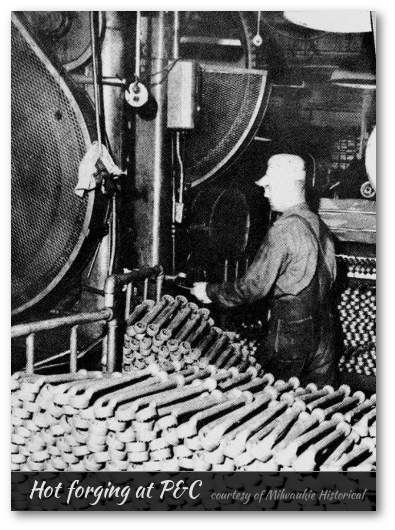 1950, approx.…P&C tools receive chrome plating. Chrome plating is sub-contracted and completed off-site by East Side Plating. 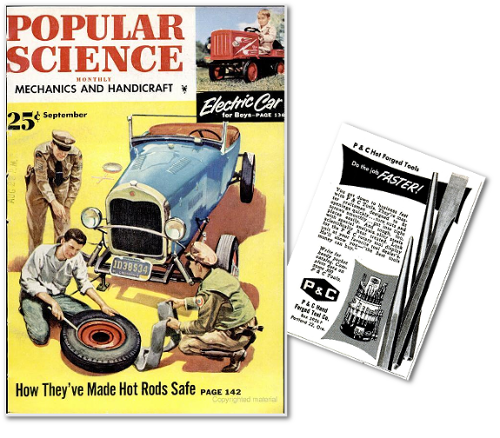 1950-1970…P&C Tools are advertised to “backyard” mechanics and American “fixer-uppers” through Popular Mechanics, Popular Science and Mechanix Illustrated Magazines. Many readers may remember these advertisements. Initially small ads buried towards the back of the magazines, the advertisements grow in size and move towards the front of the magazines as the years progress. In one of these ads from Mechanix Illustrated (1967), readers are told that 50¢ sent directly to P&C will result in them receiving an 80-page catalog as well as a promotional key-ring screwdriver. These small key-ring screwdrivers are used as promotional fare for many years at P&C and made in different configurations and stampings. 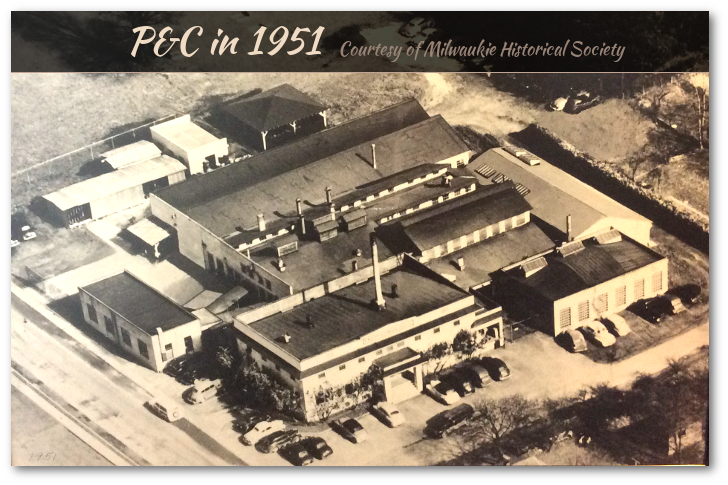 1952…Proto adds a Canadian factory to the fold in London, Ontario. 1953…P&C hexagon symbol is trademarked and the ® symbol is stamped on tools. It is uncertain when the ® symbol is first used, but it is generally accepted to have been late 1953 or early 1954. Not all tools receive the ® symbol, as can clearly be seen in the 1963 catalog, for example. The trademark registration number is 0572863 and filed on June 15, 1951. The trademark is registered April, 7, 1953, renewed in 1973 and expired 1994. The first use “anywhere” is listed as January 16, 1926 with the same date listed for “first use in commerce date”. 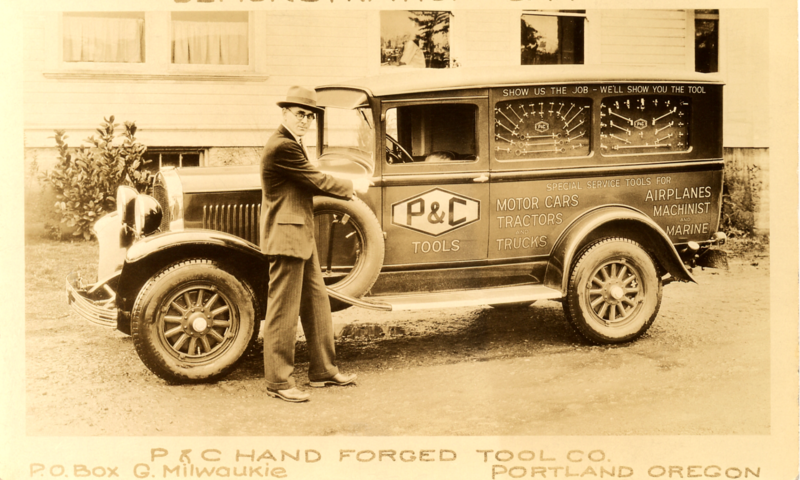 1954…Barney H. McClain becomes president of P&C Tools. 1956…New main office is completed. 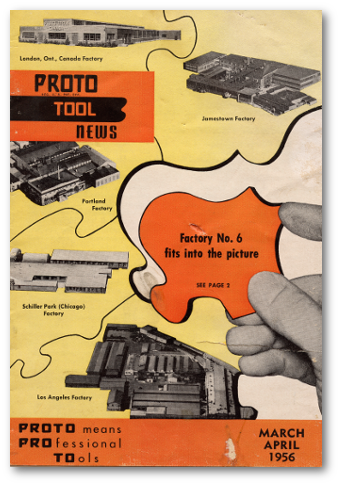 Also in 1956, Plomb-Proto adds factory number six by purchasing the Consolidated Tool Company in Los Angeles. Consolidated Tool combines with another subsidiary, Industrial Tools Manufacturing, and operates as Industrial Tools. This factory specializes in “small orders for special tools, modified standard tools and other products made to buyers’ specifications…”. 1957…P&C ships more tools in July than any month in their previous history. P&C continues to increase production and the future looks good. In January of 1957, Plomb Tool Company, working and branding tools as Proto, officially changes its name to Pendleton Tool Industries. Also in 1962, P&C completes construction of a new loading dock and warehouse. 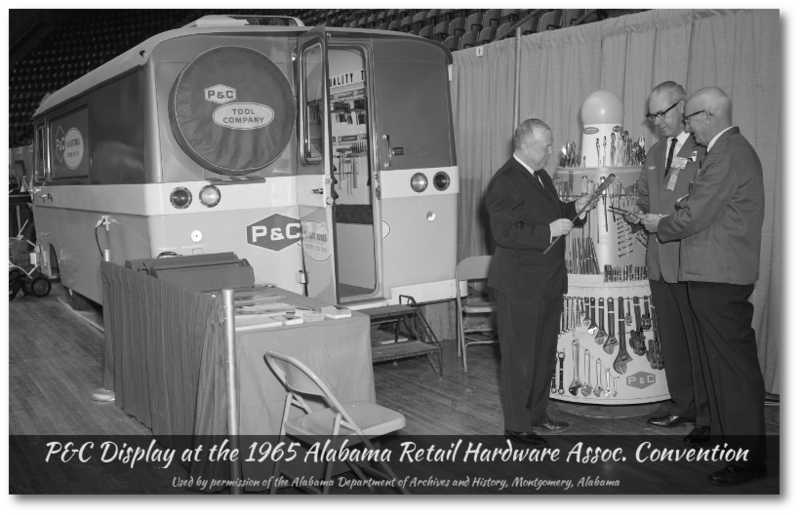 1963…P&C receives a national award from the National Wholesale Hardware Association for the company’s “contribution to the improvement of manufacturer wholesaler retailer relationship.” The award had never before been presented to a manufacturer on the Pacific Coast. President Barney McClain, accepts the award. 1967…P&C adds their own Plater Plant. Not a small undertaking, this addition consists of significant construction. Prior to the new Plater Plant, all tools receiving chrome plating were sent to East Side Plating. The tools were then shipped back to P&C for further processing. The Plater Plant consists of a monorail running through the Plater Plant carrying tools. The tools are manually added to the rail. Via the rail, the tools are raised and lowered through eleven separate tanks with the tanks organized into a “U” shape. The tanks in succession are; acid, rinse, acid, rinse, rinse, nickel, rinse, rinse, chrome, rinse, rinse. After the last rinse the tools proceed through a dryer before being off-loaded from the monorail by hand. 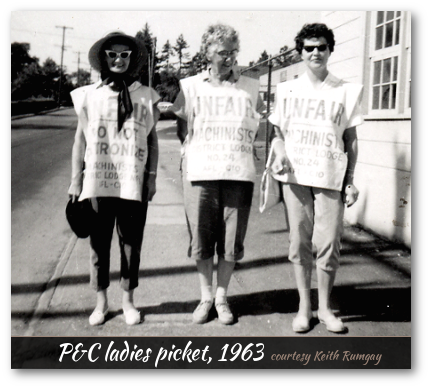 Also in 1967 (approx), P&C employs 190 people with an annual payroll of $1.25 million. The previous 10 years have seen a 250% increase in sales. According to president Barney McClain, this increase is largely attributed to revolving “lazy susan” display cases located in retail stores. Located in areas where shoppers often purchase hand tools on impulse when presented with the opportunity, these display cases have become an integral part of P&C success. The construction of the merchandising displays is completed at P&C. For a certain period this wood shop operates in the basement of the old “schoolhouse”. Processes in creating the displays include woodworking, painting, silk screening, etc. Extensive wooden displays can be seen in the 1948 catalog and include display racks for retailers as well as wooden racks to aid garages with tool organization. According to McClain, half of the hardware stores in America in 1967 sell P&C tools. 1974…P&C brand is finally dropped. Proto and Challenger are about the only brands currently being produced at the old P&C plant. In the past, at various times, Vlchik, Fleet, Penens, Plomb, were all produced as well. Blackhawk, and Williams (among possible others), had tools produced at P&C, most likely under special contract orders. 1978-1979…Original P&C building, the old “schoolhouse”, is torn down. A large steel building is erected, resulting in the entire property being essentially covered. 1979…360 people are now employed at the plant. 1990…January through March the plant is shut down. About 240 employees are affected. P&C sets vacant for a number of years before being torn down in 1995 to 2000.